Jeremy Penn was appointed Chief Executive of the Baltic Exchange in 2003, following 20 years with Reuters Group PLC where he held a wide range of positions specialising in technology and marketing related to financial information. He was Managing Director of Reuters Asia and was appointed to Reuters Executive Committee in 1996. He has lived and worked in France, Zimbabwe, Morocco, Hong Kong, Australia, Singapore and the USA as well as the UK. He is a non-executive Director and Treasurer of Maritime London. 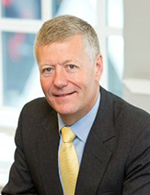 He is a director of Maritime UK and sits on the Supervisory Board of the UK Chamber of Shipping. He chairs the Steering Group for London International Shipping Week 2017 and is a Trustee of the National Maritime Museum. He was educated at Warwick School and Corpus Christi College, Oxford and later took the Advanced Management Programme at Harvard Business School.